I’ve heard it’s good luck for it to rain on your first night of the AT. I suppose it’s assurance of your safe arrival in Maine when it pours. The lightning was striking and thunder was rattling the trees around our tiny, muddy tent pad. Lucky me. Mom and my stepdad saw us off at 11 a.m. on that Friday, March 8. We got started late because everyone missed their alarms, and it’s difficult to get out of bed when it’s the last one you’re destined to see for a while. We had breakfast at the lodge in our pajamas (sorta disappointed it wasn’t a buffet) and then packed up what we had left from the night before. Through the window I could see the clouds rolling in, and I didn’t think much of it or my last shower. I guess that comes with living in the real world: showers don’t feel like sacred rituals and a roof over the head is an everyday convenience. The rain began, and the temperature was around 37 degrees when we climbed the mountain drive to the Springer Mountain parking area. We were greeted there by a gentleman who I suppose regularly sees hikers off. He helped me adjust my Zpack rain fly and inspected my pack to ensure all was in working order. We put on our rain coats and mom took her 379 pictures and I forced a hug and kiss to be seen off. It didn’t take long for the temperature to drop a little more. I didn’t notice much when we were walking, only when we stopped. The blazes were pretty easy to follow. Though it was frustrating trying to maneuver the giant mud puddles. William and I established an ongoing joke about the trail runner, Bob, who issued our AT tags at registration. When giving us the speech about Leave No Trace, he instructed us to walk through the puddles, not around them. Therefore, we regularly walk through puddles, commenting “Bob would be proud” after the deed is done. We took a few breaks for snacks before going on and got to camp around 3 p.m. We got our tents set up and chowed on some pepperonis, jerky and Triscuits. We went and filtered some water and visited the privy before the rain really started coming down. That was the first privy I had ever been subjected to, and I quickly decided that I would rather dig catholes. We had intentions of making dinner, but we learned pretty quickly about the flow of hiker bedtime, which is only dictated by two things: darkness and weather. So we put our food bags into the bear box and were in our tents by 5 p.m. I mostly lay there and journaled and made videos since there was nothing else to do. I was wise enough to download a few e-books beforehand, and so I opened The Gunslinger to kill some time. I also hung some things in my tent to dry, including some cash that I forgot was in my pocket and had now become quite soggy. My hands were cold, but not terribly. I didn’t mind relaxing or the sound of the rain from inside my warm, cozy tent after walking. I stashed away a few snacks for the evening in my tent and began to munch on a Milky Way, two granola bars, and a few packs of fruit snacks. Having trash in my tent, especially on the first night, kept me a little paranoid about bears approaching my tent. Rain would fall on one side, and I was sure it was a bear walking. After a while, I realized that if that bear was crazy enough to come out into this downpour and attack me on my first night, I probably wasn’t cut out for this. Will entertained with some nice anecdotes throughout the afternoon. Lots of bad wilderness jokes. I heard him every time he rolled around on his sleeping pad. 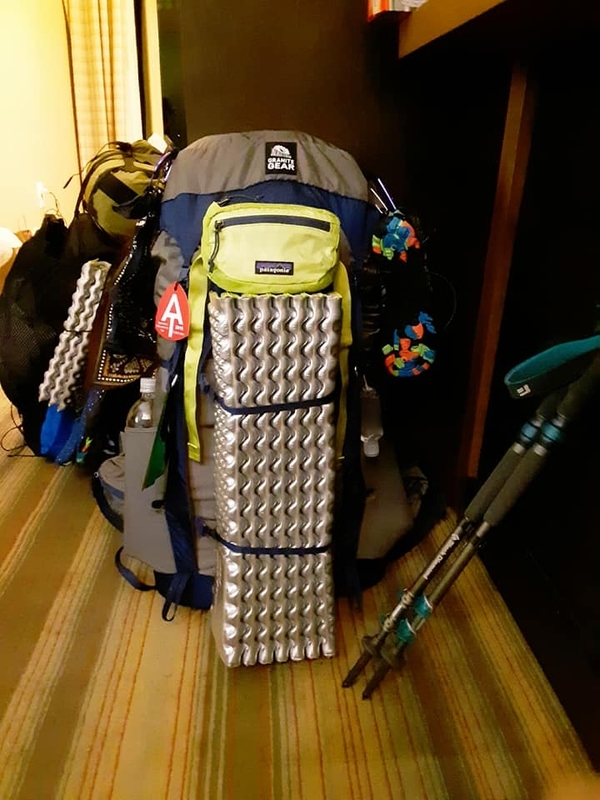 We immediately began discussing what gear we could ditch to make our packs less heavy and praising the things we were already glad that we had brought. I was really glad that I got my pack first and adjusted my gear to it. I adopted a lot based on the way my pack carries and the way its storage is distributed. My Granite Gear Crown was about 35 pounds, and I was pretty sure I could shake down my pillow and a layer of clothing or two. I was already looking forward to ditching the winter gear. We met our neighbor, Fireball, from Denver. She seemed nice, but we kept hearing her talk to someone. I couldn’t decide if she was on the phone or if she was making a video. Though neither of us had signal. She was on one side of our camp, and Austin was on the other. There was another couple that we began identifying by their rain covers. They were nice and we yo-yoed all the way up the trail with them. Pink and Green would pass while we took a break, and then we would pass them while they were on a break. Though we never saw them after that. They were already gone when we left camp in the morning. When we woke up, Fireball was also gone. The rain subsided, and we had dinner for breakfast with some coffee. Camp was packed with a little struggle (since everything was soaked) and we set out some snacks for another day’s trek. I put on my heavy pack, smiled, and realized that I had survived night one. Let the journey begin.